As an ArcMap user, you may be ready to bring your work into ArcGIS Pro. In this tutorial, you'll create a new ArcGIS Pro project, import an ArcMap map package (.mpk), and examine the results. Even if you're not an ArcMap user, you may need at some point to bring a map document or map package into ArcGIS Pro. You don't need ArcMap software to do this tutorial. On the start page, under New, click Start without a template (you can save it later). If you already have a project open, click the Project tab on the ribbon. In the list of tabs on the left, click New. Under Project Templates, click Start without a template (you can save it later). The application opens without prompting you to create a project. Although you typically save your work in ArcGIS Pro as a project, it isn't always necessary. For example, if your tasks involve data exploration or management, you may not need to store results in a project file. 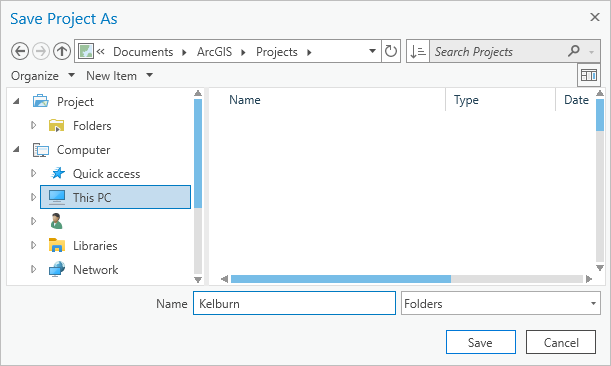 After starting ArcGIS Pro without a template, you can save your work as a project at any time during the session. When you start without a template, the application opens with no open views. The ArcMap map package you'll import contains a map document with two data frames and a layout. 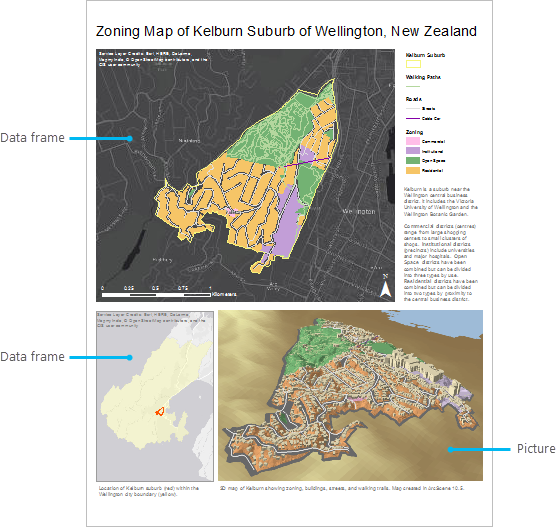 One data frame displays zoning in the Kelburn suburb of Wellington. The other data frame shows the suburb in relation to the rest of the city. Both data frames appear on the layout, which also contains a legend, a picture, and other map elements. On the ribbon, click the Insert tab. In the Project group, click Import Map . On the Import dialog box, in the directory on the left, under Portal, click All Portal. 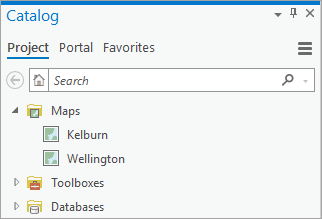 At the top of the dialog box, in the Search box, type Kelburn map package and press Enter. In the list of search results, click Kelburn to select the map package. A map view named Kelburn opens. This map corresponds to one of the two data frames in the ArcMap map document. Layers representing the suburb boundary, walking paths, roads, and zoning are displayed on a dark gray basemap. You'll use the Catalog pane to see other items that were imported with the map document. In the Catalog pane, on the Project tab, expand Maps. The project contains two maps: the open Kelburn map and a map named Wellington. 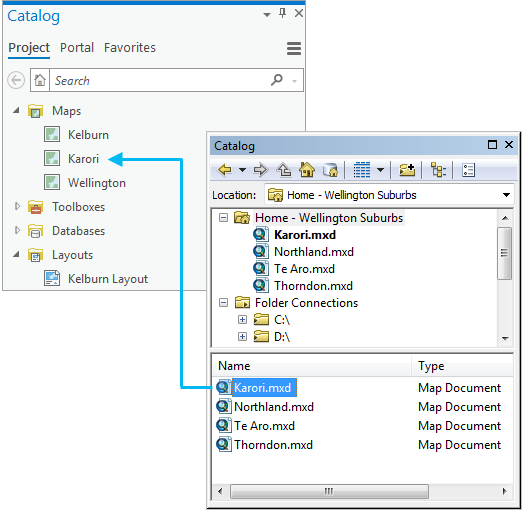 The Wellington map corresponds to the second data frame in the ArcMap document. Each data frame in an ArcMap document becomes a separate map in ArcGIS Pro. The following image shows the two data frames as they appear in the ArcMap table of contents. Each data frame in an ArcMap map document becomes a map in ArcGIS Pro. In the Catalog pane, under Maps, right-click Wellington and click Open . The city limits of Wellington are shown in light yellow. 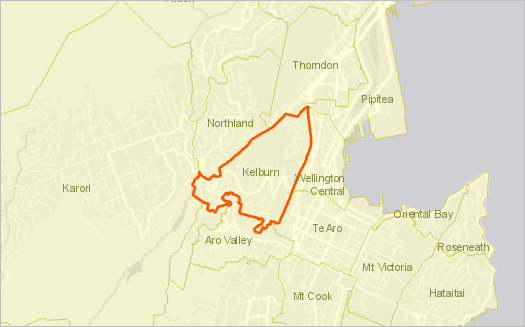 The suburb of Kelburn is marked with a red outline. In the Catalog pane, expand Layouts. The layout in an ArcMap document becomes a layout item in ArcGIS Pro. 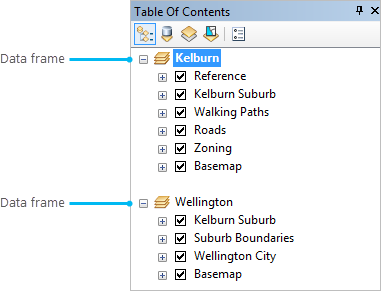 The name of the layout, KelburnMap, matches the name of the imported ArcMap document. 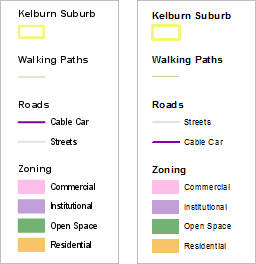 Under Layouts, right-click KelburnMap and click Open . The layout looks like the image of the ArcMap layout at the beginning of this section. It's confusing to have a map named Kelburn and a layout named KelburnMap in the same project. You'll rename the layout. In the Catalog pane, under Layouts, right-click KelburnMap and click Rename . Rename the layout Kelburn Layout and press Enter. The new name is displayed in the Catalog pane and on the layout view tab. 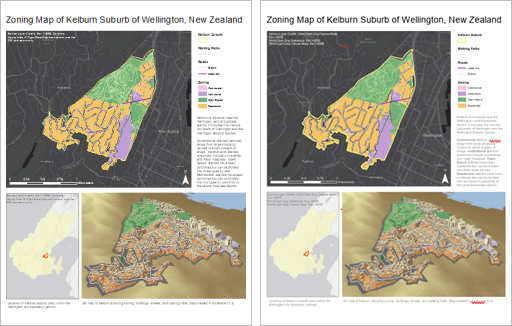 The project now has three open views: the Kelburn map, the Wellington map, and the Kelburn Layout layout. The layout view is active. In the upper right corner of the ArcGIS Pro window, the Notifications bell has a blue dot. This means there are notifications to look at. In this case, the notifications are about the map import process. Click the Notifications bell . In the Notifications pane, hover over the message and click View Results. When you hover over the message, the View Results link appears. A browser tab (pointing to a local file) opens with import results. There are three warnings that basemap layers cannot be published directly to a service. 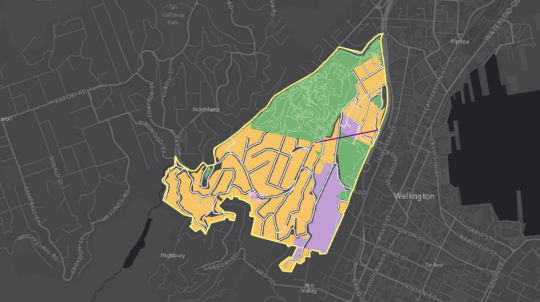 (The warning appears three times because the Wellington map has a basemap and the Kelburn map has a basemap and a reference layer.) Although the warnings have high severity, they're only important if you share the map. Three other warnings describe possible problems with the imported layout. These are generic warnings that don't imply specific problems with this layout. Close the browser tab with the import results. In the Notifications pane, click the Menu button and click Dismiss all. The blue dot disappears from the Notifications bell. You can also import a map document by dragging it from ArcCatalog or the Catalog window in ArcMap onto the Catalog pane in ArcGIS Pro. 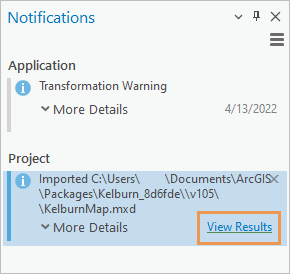 Select multiple map documents to import them in one operation. Map documents can be dragged from ArcMap or ArcCatalog to ArcGIS Pro. The Kelburn map shows how the suburb is zoned. More than 50 percent of the suburb is zoned for residential use. About 35 percent is zoned for open space. About 12 percent is occupied by the Victoria University of Wellington and zoned for institutional use. Less than one percent is zoned for commercial use. The Wellington map is an overview map. 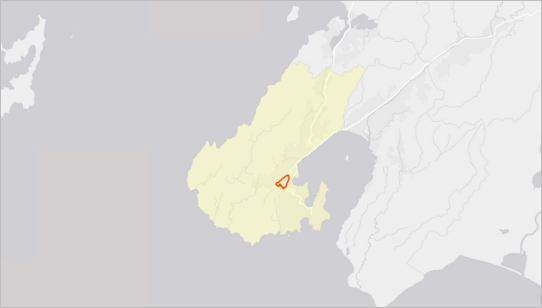 It shows the location of Kelburn in relation to the rest of Wellington. You'll look at both maps to confirm that layer properties set in ArcMap have been maintained in ArcGIS Pro. Click the Kelburn map view tab to make it active. In the Contents pane, click the Zoning layer to select it. The Symbology pane appears. 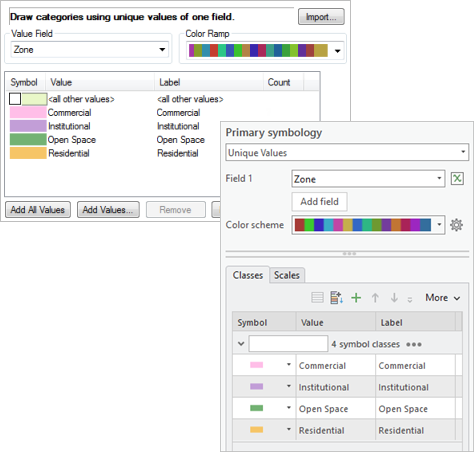 The Zoning layer is symbolized by unique values on the Zone field of the layer attribute table, just as it is in ArcMap. ArcGIS Pro and ArcMap use different methods to construct symbols, but the appearance of imported symbols is usually the same. For more information about how symbols are modeled in ArcGIS Pro, see Symbols. The symbol colors for the Zoning layer have identical RGB values in ArcMap and ArcGIS Pro. However, symbol colors may not match exactly when you import algorithmic color ramps or when colors are defined with color models other than RGB. See Visual differences in imported map documents. You have confirmed, for this layer, that symbology properties are maintained in the imported map. Next, you'll confirm that the field properties of layer attribute tables are maintained. In the Contents pane, right-click the Roads layer and click Design > Fields . The fields view of the Roads attribute table opens. 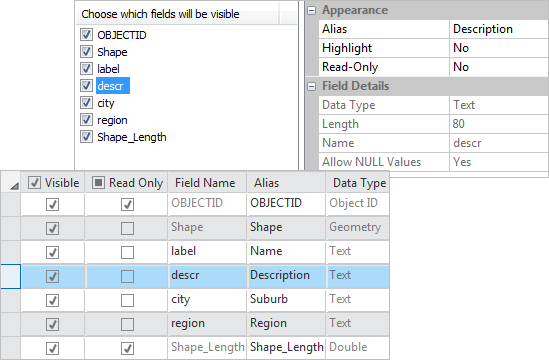 The fields view is used to display and edit field properties. The following image shows that field names, aliases, data types, and other properties have been imported with no changes. Top: Properties of the descr field in the Roads layer in ArcMap (top) and ArcGIS Pro (bottom). In both cases, the field name is descr, the alias is Description, and the data type is Text. Close the Fields: Roads (Kelburn) view. Make the Wellington map view active. On the ribbon, on the Map tab, click Bookmarks . Under Wellington Bookmarks, click Suburbs. In the Contents pane, click the Suburb Boundaries layer to select it. On the ribbon, under Feature Layer, click the Appearance tab. In the Visibility Range group, note that the Out Beyond setting is 1:100,000. This matches the layer's Scale Range setting in ArcMap. 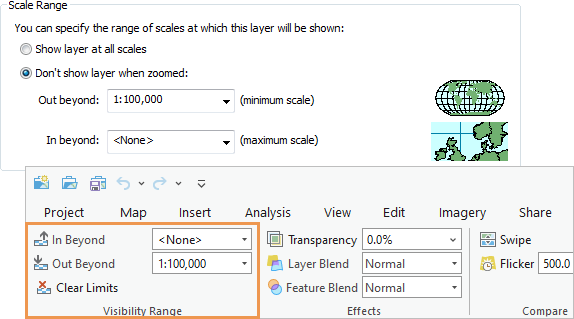 Top: Scale range settings for the Suburb Boundaries layer in the ArcMap layer properties. Bottom: Visibility range settings on the ArcGIS Pro ribbon. In ArcGIS Pro, the current map scale is shown in the lower left corner of the map view. The Text Symbol group shows the label symbol properties. The font is Arial 8 point Regular and the color is Lichen Green (its RGB value is 137, 137, 68) . These settings match the ArcMap layer property settings. Top: Label properties for the Suburb Boundaries layer on the ArcGIS Pro ribbon. Bottom: The equivalent settings in ArcMap. 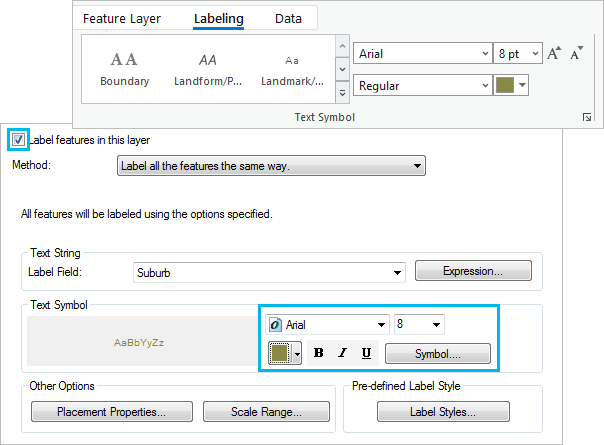 In ArcGIS Pro, advanced label settings are managed through the Label Class pane. This pane appears when you click the Text Symbol Dialog Box Launcher or the Label Placement Dialog Box Launcher on the Labeling tab. A quick visual comparison of the ArcMap and ArcGIS Pro layouts shows that they are nearly identical. You'll take a closer look at some of the layout elements. Make the Kelburn Layout view active. In the last section, you zoomed in on the Wellington map to see the suburb names and boundaries. Notice that the Wellington map frame in the layout remains zoomed out to the entire city. In ArcGIS Pro, you can compose a layout while navigating freely in the map view. The Contents pane lists all the elements in the layout. To work with an element, you can select it on the layout view or in the Contents pane. Hover over a layout element in the Contents pane to identify it. In the Contents pane, click Alternating Scale Bar. The item is selected in the Contents pane and on the layout. The scale bar is in the lower left corner of the Kelburn map frame. It's hard to see that it's selected because the selection box is black. On the ribbon, under Scale Bar, click the Design tab. Scale and unit settings such as the division value, number of divisions, and units have been imported correctly from ArcMap. The Design tab settings on the ArcGIS Pro ribbon match the Scale and Units tab of the Alternating Scale Bar Properties dialog box in ArcMap (not shown). Other layout element settings have also been imported correctly. For example, text elements have the same font properties. The scales of the Kelburn and Wellington map frames are the same as in the original ArcMap layout. A minor difference can be seen in the legend. In the ArcGIS Pro legend, under Roads, the Cable Car legend item appears above Streets. In the ArcMap legend, Streets is on top. Left: The ArcGIS Pro layout legend. Right: The ArcMap layout legend. This difference isn't an error. It's a result of the different ways in which ArcGIS Pro and ArcMap prioritize the <all other values> symbol in a layer. You imported an ArcMap document to see how it looks in ArcGIS Pro. If you are interested in the comparison but not in saving the map, you can exit ArcGIS Pro now and click No on the prompt to save changes. No project file will be saved. Alternatively, to save the map for future work, you can save the project. The Save Project As dialog box appears. By default, the project will be saved in your user documents/ArcGIS/Projects folder. In the Name box, type Kelburn. The project file and associated items, including the project geodatabase and toolbox, are saved in a folder with the same name as the project. ArcGIS Pro imports most data frame and layer property settings exactly from ArcMap. However, the two applications have different drawing engines, so differences may occur in the way symbols, colors, and fonts are handled. ArcGIS Pro does not import elements from ArcMap if the underlying functionality is not supported. For example, map annotation is not imported. In addition to ArcMap documents, you can import 3D documents from ArcScene and ArcGlobe. You can also convert 2D maps to 3D scenes in ArcGIS Pro as explained in the Create a project and Convert a map to a scene quick-start tutorials. To learn more about layouts in ArcGIS Pro, try the Make a layout tutorial. For information about importing models and scripts from ArcMap to ArcGIS Pro, see the last two related topics below.